Views from the loch. : Back on track! Our AGM was held yesterday and saw the biggest turnout of members I had ever witnessed! Yes sticking two fingers up to the spiteful wretch that is Mr Xxxxx the meeting approved his sacking and heartily bummed him into the weeds! A man who when his fiendish plan to make a living from the club at the expense of our continued sport was exposed turned nasty and tried to destabilise the club! All he actually managed to do however was to make a fool of himself, place himself under house arrest, unable to traverse the lochside like every other resident of the village and get himself barred from entering the land of the Tibbie Shiels Inn. I had once thought there might be some who would fall on his side but our comprehensive expose of his ridiculous actions and his absolute lack of knowledge meant that not one vote did he secure, not one person spoke in his defence! His absurd actions made 2016 the worst ever year in the clubs history showing himself to be a Walter Mitty and worse a proven liar! There was uproarious joy as he was pronounced not only down but out for a lifetime! The meeting felt that taking legal action against him would be futile as he has no assets and any award due to us would remain unpaid! We are happy to let him keep our radios, lights etc and allow him to play sodjers up on the hill to fill up his empty days when the rest of us are working! He stated in his valedictory speech that he “would not walk away from a club in which he had invested so much” (lol) as he will be finding out now, humble pie can be a bugger to digest! Never again will this vagabond darken the steps of the club boathouse, an embarrassment to the club and to the village! To Mr Xxxxx the meeting said with one voice and without reservation - Good riddance and let us get on with running the club! With the wee man barred for a lifetime the meeting went on to consider the other items on the agenda. With regard to the proposed pier Gordon McClurg proposed that we dispense with this project as once we have the bottom dredged there will be no need for a pier. With our metal framework we will construct a walkway into the water supported by heavy duty fence posts which will give us ample access into the loch. This is a simple measure that will achieve all the pros of a pier without the many disadvantages! The meeting unanimously approved this motion. Elliot Fraser gave us a comprehensive rundown of our financial position with members being made aware of the true position of the club. Instead of financial irregularity there was seen to be a high degree of fiscal competence that has given us the highest financial total ever accrued by the club! Yet again the little man with his wild accusations is left with egg on his chin as his ridiculous allegations were swept aside! The meeting thanked Elliot for his excellent work! We decided to amend the prize for our heavy Pike competition with the £20.00 prize being replaced by free membership of the club for a year which was proposed by Davy Forsyth and approved by the meeting. 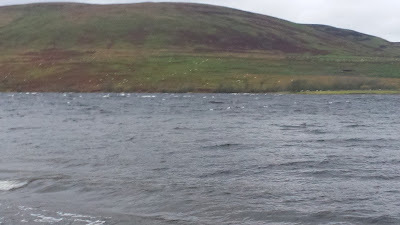 Our annual wild Trout competition will go ahead in early April with the exact date to be decided soon. Photo 02 - Conditions one year ago yesterday! With regard to steps we can take to improve the fishing our hands are tied by not being allowed to stock fish. 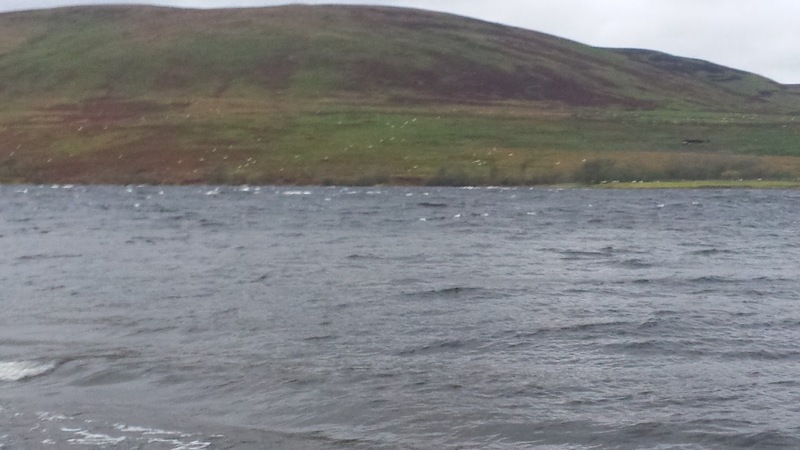 We thought we would check with Scottish Water and the other regulatory bodies (there are loads) if we could anchor some wire baskets on the loch bed in the hope of providing safe havens for some small fish. We thought three baskets would suffice as an initial experiment. The weights we made for the intended pier will be ideal for anchoring the cages. The use of the club engines was discussed at length and the first thing decided was that we will not hire out our engines to visiting anglers, they will however be permitted to bring their own (max 4HP) if they wish. Once our engines have been serviced they will be available for use by members and for general club use as in towing and ferrying people as required. Our fallback position will be the purchase of up to two second hand engines as required. We will under no circumstances implement the preposterous fishery ruining views of Mr Xxxxx! On the subject of the date for membership renewals there was complete agreement that the January renewal date is not very helpful at a time when there is much expenditure on the festivities. Consequently all of the 2017 memberships will run past the January deadline until the end of February 2018. New memberships will start from 01/03/2018 and a weeks grace will be allowed. We then went on to appoint the club committee and it was made clear that now we had ejected Mr Xxxxx all the then current committee were more than happy to step down and allow other interested members to take the reins! Naturally there was much discussion but the unanimous view of the membership was that the current administration should be re elected! Now this left us with a small but constitutionally viable committee of four but to get a better spread of views we would have liked six members. Gordon McClurg was proposed by Mike Wood and seconded by the whole meeting, whilst Davie Forsyth was proposed by me and again seconded by the whole meeting! We now have a strong and broad based committee and we the existing members Frank, Stevie Elliot and me look forward to working with Gordon and Davie to secure the best for the club in the future! On behalf of the club I would like to thank all who were present for playing such an active role in the meeting and for setting out the path that will guide the club from a position of strength to an even stronger one. To the many who contributed thanks, especially if you have not been mentioned. Special thanks are due to Elliot Fraser who despite a busy life at home manages to do such a sterling job in keeping the club on an even keel in spite of living a great distance away. We would also like to extend our thanks to Alastair at the Tibbie for allowing us the use of the big room for our meeting. Finally on a personal basis I would like to thank the meeting for bestowing on me the honour of becoming a life member of the club at the behest of Elliot Fraser. It was an unexpected and humbling experience, but even though I feel undeserving of it I must (as everyone must) accept the will of the meeting! Instead of paying the current membership fee at the appropriate time I will make an equivalent donation to the club on a yearly basis. The club has always been one of my hobbies and it will continue to be so until I am called! Thank you one and all, St Mary's Angling Club is back on track! I was too late in getting along to help with lifting the boat into the boathouse yesterday due to handing over membership receipts to Elliot. Whoever carried out the task thank you, this will allow us to push on with the refurbishment. 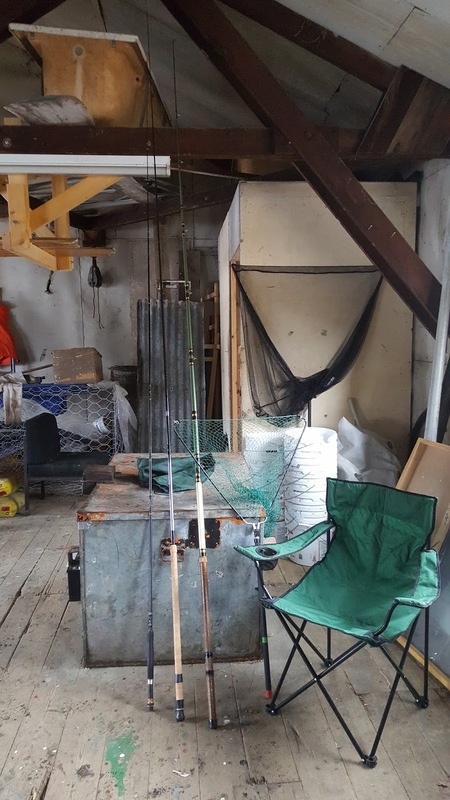 Thanks are also due to life member Les Robson who donated to the club a Shakespeare #7graphite fly rod, a 13ft match rod in graphite that looks new and a vintage ledger rod that would do as a light Pike rod. He also threw in a serviceable landing net once the old knotted net has been replaced and a folding chair. So all these items will be available to members if needed - thanks Les and great speaking with you on Wednesday!